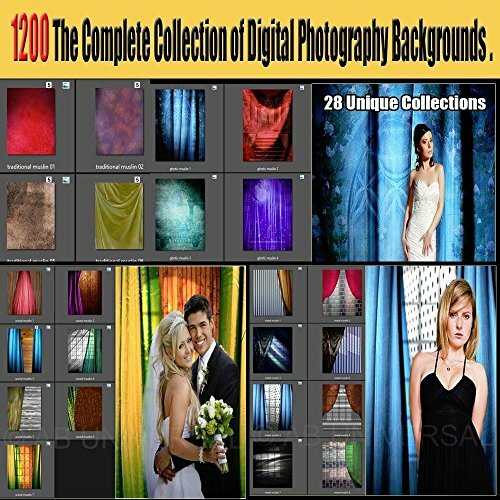 1200 The Complete Collection of Digital Photography Backgrounds - 28 Unique Collections. Autumn - Car trucks and trains - Christmas - Desert - Doors - Elegant - Fantasy - Flowers - Gothic Graffiti - Grunge - Birthday - Kids - Love - Metal - Pillars - Scenery - Stairs - Sunset Towers - Muslin - Urban - Walls - Wedding - West - Windows - Wood Muslin This Collection is great for weddings, stock photography, art, children, photographers etc. For photographers and graphic designers who want to take their business to the highest level. backgrounds are of the finest quality available. Digital Backgrounds are JPG images sized at 8 x 10 inches at 300 pixels per inch for a pixel dimension of 2400 x 3000. These products are copyright protected and can not be resold as they are. They are designed to be used as backgrounds, or composite album pages to enhance your own personal or professional portrait work. You will need a photo editing program. We recommend Photoshop 6 or newer. There is also a FREE photo editing program available from gimp. 1200 JPG images sized at 8 x 10 inches at 300 pixels per inch for a pixel dimension of 2400 x 3000. If you have any questions about this product by ABUniversal, contact us by completing and submitting the form below. If you are looking for a specif part number, please include it with your message.